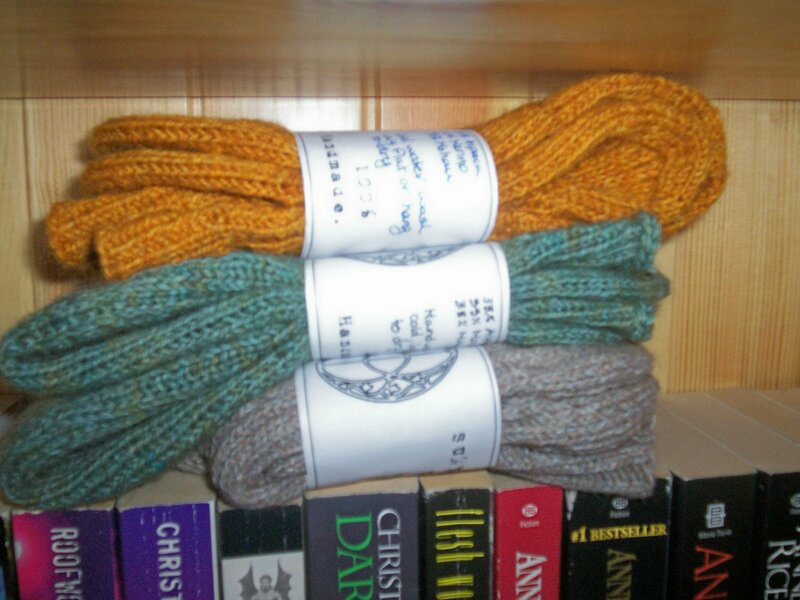 Here are some commissioned knits awaiting their new home. It’s safe in the bookshelf. Three pairs of men’s socks. Next up, or already started should i say are the two pairs for Janelle, harder to make but maybe I need that to stay awake in classes. These three pairs however are done and waiting. I gave myself a deadline to make them and came in in good time so yay. As you can see I’ve been working on that 101 things, here are some grasses waiting to be stuffed and eyeballed, all the neiclings and nephling are getting one for x-mass. I’m going with the rule of four for x-mass. Then I’ll pad what I have with more if I need to or feel I need to. But for now I’m two and a half grasses done. That’s right I’m accomplishing things even in the haze of books. 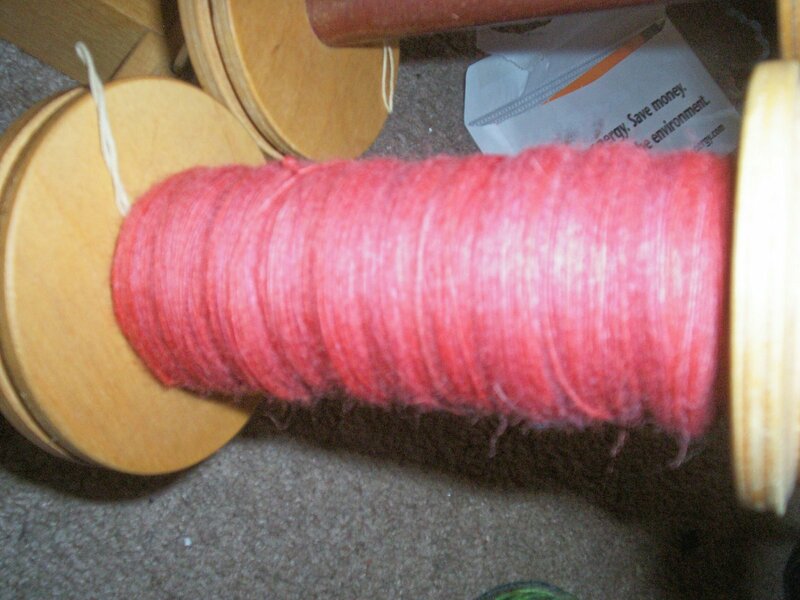 If you think it’s been all knitting in my world you’d be wrong o. I have been spinning too. I finished this bobbin last weekend, and am spinning it’s accomplice at the moment. It’s stuff I dyed myself so I’m attached to it on many levels, it doesn’t know what it wants to be yet. It’ll tell me when it feels like. I’ve still got a skein that needs to be set. I’m going to wait until i have a few skiens to set before I go all set crazy and have an apartment that smells of wet sheep. Kinda makes the cats nutty. Just sayin. They all stand in the bathroom mewling at the hanging yarn, which is strange cause they generally ignore all yarn. I have good cats that way, they have no urge to play with it, only errant strings. And last but not least, a hat. Yes it’s a strange hat, maybe that’s why I made it/like it. 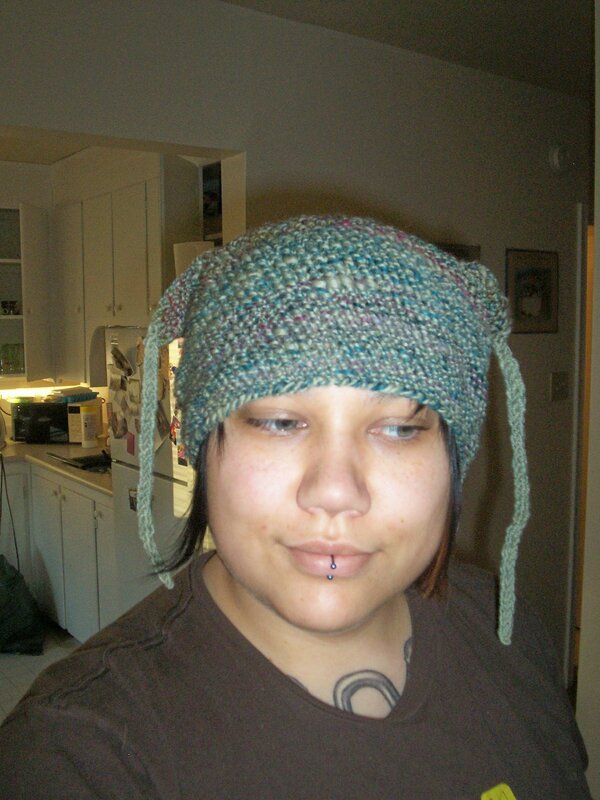 It’s modified from cosymakes geometric helmet hat pattern. I used hand spun silk/merino handdyed with elderberries plyed with silk hankie spun and romney spun, basically a mishmash of things. It looks a little odd, like me. And it hides a multitude of hair sins, since the hair and I are not getting along lately. But I think I’ll make a semi-normal hat to go with as well, and another beret…. okay so I’ve been on a bit of a “I NEED TO MAKE HATS NOW” kick. 101 in 1001. Start date…. NOW. End date: Thursday, July 7, 2011. 2) Finish Cable Hell Its being frogged, let’s not talk about it. 20) Make or buy local for five family members for the holidays. Neices and Nephling each count as 1. 21) Give two garbage bags full of things to charity. 22) Save $1000 dollars for frivolity. Just to see if I can. 23) Learn how to make a PDF pattern. 24) Make said pattern available for sale. 25) Not cut hair except for bangs for a year. 26) Get three more tattoos. 30) Sew a Pair of Pants that does not have a drawstring waist. 31) Get NetFlix if it’s available in Canada, get something similar if not. 32) Print 10 blocks of Speedball art. 34) Design and block print five t-shirts. 35) Eat at home three days a week for one month. 39) Make soap possibly from a kit but try it anyway. 41) Read 50 books (audio books okay comic books no) in one year. 43) Leave Regina for other places travel related twice. Concert trips count. 44) Go To N.Z. after graduating from University. 45) Create business plan for the Yarn Prawn. 46) Get secure funds for the Yarn Prawn. 47) Do a Cure themed sock yarn run. 58) Collect all the sandman comic volumes. 59) Organize pictures in albums. 61) Knit socks out of my own handspun. 66) Drink at least one glass of water a day for three months (hopefully this helps the weaning off caffeinated products). 67) Knit two socks at a time. 68) Attend a knitting convention or fiber convention. 69) Bake something at least once every two months for a year. 70) Not dye my hair more than once a month for a year. 71) Make a queen sized quilt. 72) Meditate once a week for three months. 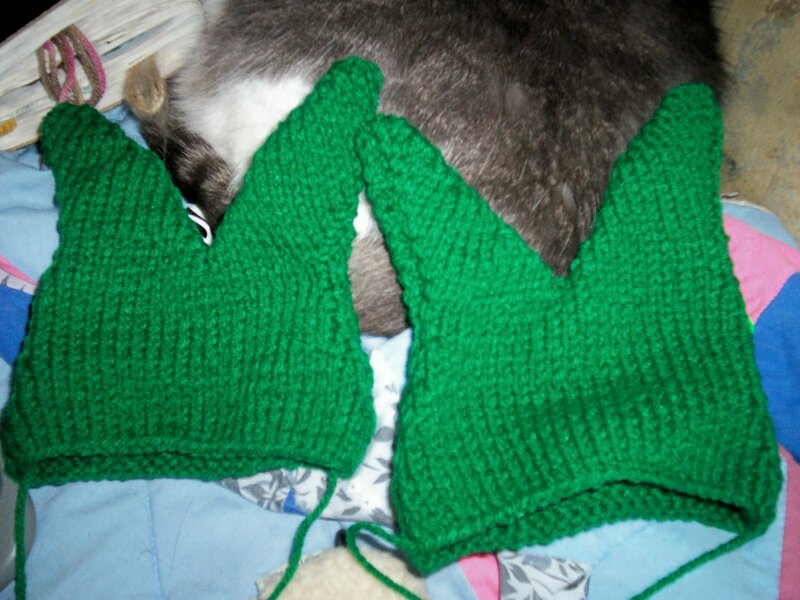 73) Finish three cardigans/sweaters/coverup’s for myself. 76) Host a Big Lebowski Bowling night. 77) Learn how to make cornbread. 78) Ask out a random stranger (coffee is enough in this case). 79) De-stash my wardrobe once. 80) Eat ethnic at least once a month for a year. 81) Learn to make skuffles. 82) Re-read the Lord of the rings trilogy. 84) Cull the bookshelf once. 85) Have no more than five projects on the go for a year. 87) Work at one job for one year. 88) Take Calcium tablets regularly (three times a week for one month). 89) Have a John Huges movie marathon. 90) Knit something with beads and actually finish it. 91) Watch all the Red Dwarf episodes. 92) Get matching cutlery that doesn’t rust or bend.